Lovely painting on silk by the Chinese artist Zhao Ji (1082-1135). The artist may be more famous for becoming Emperor Huizong of the Northern Song Dynasty but The Famous Artists is focusing on his artistic endeavors. This lovely bird painting, shows a colorful pigeon perched on a blooming peach branch. It is our favorite painting by Zhao Ji. He is able to add the bright white flowers in such a way as to not overshadow the more muted colors of the bird by only including one flower in full bloom and a number of smaller flower buds. 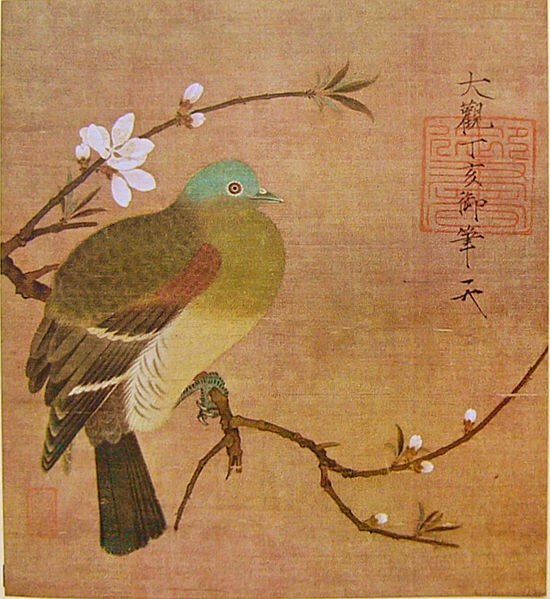 The level of detail (see the tiny nails on the pigeon’s feet) and the individual feathers leave one to wonder how China’s history and the art world would have been different had Zhao Ji’s brother remained on the throne and allowed the artist to pursue his painting. To learn more about the artist and to see more of his work, please visit our Zhao Ji biography.